The gastric LAP-BAND® System is a relatively safe and effective weight-loss procedure that works by limiting the amount of food an individual can consume. An adjustable band is used to create a smaller stomach chamber that holds significantly less food, causing the patient to get fuller faster. This forces the patient to reduce the amount of calories consumed, resulting in loss of weight. The LAP-BAND® Adjustable Gastric Band is inserted into the abdominal area laparoscopically and moved into place before it is clasped into position around the stomach. The band can be adjusted at any time to suit the needs of the patient. Bariatric surgery using the LAP-BAND® Adjustable Gastric Band is one of the most popular bariatric surgery procedures because it is a successful and relatively safe way to lose excess weight. 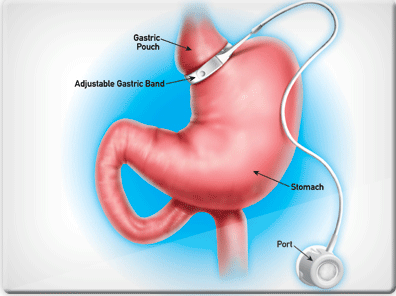 In addition, the LAP-BAND® Adjustable Gastric Band procedure is effective at reducing the risk for developing serious health conditions that are associated with morbid obesity, such as stroke, sleep apnea, liver disease, acid reflux disease, asthma, and much more. The LAP-BAND® System is also adjustable, allowing it to be customized to the unique needs of each patient. Plus, because the stomach and intestines stay intact, the procedure can be reversed without issue if necessary. Patients also experience short recovery times because the procedure is done laparoscopically.